PLEASE NOTE - We except Pay Pal ,checks and money orders, Call for details or email us. The technique used in the building of my mandolins was taught to me by old time mountain craftsmen. This style of building is very strong and the sound is great. I cut the sides of the body from a solid piece of wood. The sides are approx.1/4 thick. Then I pick out the top and bottom wood which grows here in the Smokey mountains. 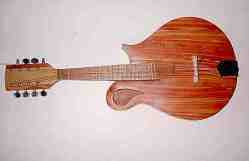 I build my Mandolins from several kinds of wood. Most of my mandolins are made with maple or spruce but I have also built them from Red Cedar which is a richer in sound - through to Walnut, Cherry, Poplar, Wormey Chestnut or Western Cedar. It does not matter as every wood gives a slightly different sound. The softer woods are mellow and the hard woods are sharper and louder. The sound hole is in the upper left corner. The reason for this is that the whole top can vibrate and not be hindered by a centrally placed hole in it. My neck is bolted on and not glued on in case it ever needs to be repaired. It can also be shimmed to help make the action lower or higher and help it play better. I use lacquered semi gloss finish. There are 8 geared mandolin tuners. This is a different style of mandolin than you can buy from the music store and is hand build by a musician for musicians in the high quality mountain tradition - try one and I think you will love it. This is a electric 5 string Mandolin . It have tone and volume controls with one Fender pick up. You can use it on any amp and get the sound you want just by adjusting the amp and the controls on the instrument. I build these from Poplar wood. It is a full size Mandolin .The total length is approx. 26 inches. The body is 9 3/4 at the widest and 2 inches thick. It has a semi-hollow body. I use geared guitar tuners so the instrument is easy to tune and will stay in tune. It has a mandolin tail piece with a strap button. Anybody looking for a electric semi-hollow body 5 string Mandolin, This is it. The 5th string goes one note lower than a regular mandolin. 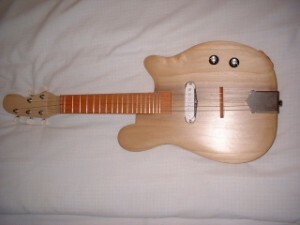 This is an electric Mandola which is a long neck Mandolin . It has tone and volume controls with one Fender pick up. You can use it on any amp and get the sound you want just by adjusting the amp and the controls on the instrument. I build these from Poplar wood. It is a full size Mandola . It has a semi-hollow body. Anybody looking for a HAND BUILT electric semi-hollow body ELECTRIC Mandoia, This is it. 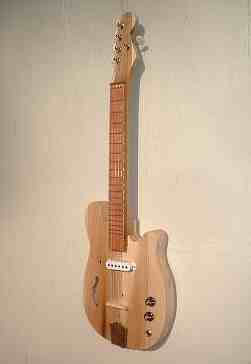 This plays the same as the Mandoiln but with a longer fret scale.